When moving to Southwest Florida, you are most likely seeking a home that has everything that you are looking for – after all, this could be your permanent retirement home or seasonal getaway for many years to come. You want a home that has it all – an ideal central location, beautiful natural surroundings, and a set of luxurious and convenient amenities at your fingertips. One such Southwest Florida community that delivers all three is the stunning community of Grandezza. 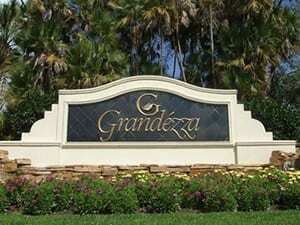 Grandezza is a gated golf community centrally located in Estero, one of Florida’s fastest growing cities. With a home in Grandezza you are close to some of Southwest Florida’s most popular shopping malls – Gulf Coast Town Center and Coconut Point Mall – and because you’re sure to have frequent out-of-town guests, you’ll also likely appreciate the community’s close proximity to Southwest Florida International Airport. Residents of Grandezza have three levels of membership to choose from at The Club at Grandezza; they can become a Golf Member, Sports Member, or Social Member. Those who love to golf will certainly enjoy the 18-hole, championship golf course that serves as the focal point for the entire community. When it comes to a community with beautiful natural surroundings, the lush course and landscapes that surround Grandezza provide an excellent sanctuary for the local residents as well as the local Florida wildlife. In terms of amenities, Grandezza is packed with extras that are sure to keep even the most active families and seniors happy. If golfing isn’t your thing, then give tennis a try or take up swimming in the on-site junior Olympic-size pool. Those just looking to relax can stroll through the meticulously maintained walking paths, browse through the pro shop, or get pampered in the spa. A state of the art fitness center allows residents to stay in shape, while the community also boasts world class indoor and outdoor dining options. Grandezza is separated into ten distinct neighborhoods, each with its own unique personality and style. Whatever size or shape home that you are looking for, chances are you can find it within the Grandezza real estate market. Coach homes, garden homes, single family homes, and estates are all readily available within the gates of Grandezza, and with prices ranging from the 100,000’s to over a million dollars, there is truly something for everyone waiting in Grandezza.